The Weber Q 320, a standalone version of the popular picnic and tail-gating portable, brings the convenience of gas cooking to the outdoors. A good size for backyards and patios, the Weber Q grills restaurant style without the smoke and mess that chefs either love or hate. Accessories you'll need to provide include a AAA battery to power the electronic ignition and a twenty-pound propane tank. Assembly isn't difficult, but you'll need proper tools and must follow directions exactly. Propane leaks are not acceptable problems. 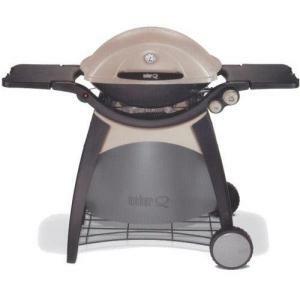 The capacity of this compact grill is sufficient to slow cook two whole chickens or char-grill eighteen hamburgers. With this type of system, that special grilled flavor comes from char on the grill itself rather than from charcoal smoke, so be sure to oil the grill before that first use. If you're using this type of grill in a breezy location, you may have problems with cold spots, so pay attention to wind exposure. The Weber Q has several nice perks, including a cooking thermometer mounted in the cast aluminum cover, a small warming rack above the grill, and two fold down side tables for holding sauces and tools. Cleaning will include careful removal and emptying of the drip pan after use. Want a smaller grill you can use both indoors and out? Check out this portable model from George Foreman.